A message from Yitz Glick, the brother of Temple Mount activist Yehuda Glick who was shot four times last Wednesday by an Arab terrorist in Jerusalem, reveals shocking differences in the US administration's reaction to events in Israel. The message was sent to journalist and editor Caroline Glick of Makor Rishon and the Jerusalem Post, who on Tuesday shared it on her Facebook page with the words "I wonder what (US) Amb. 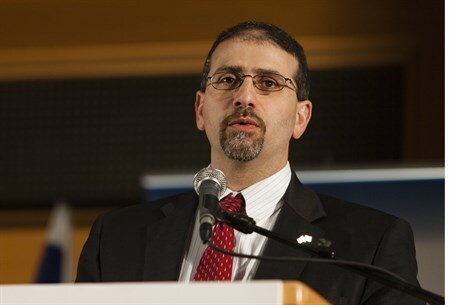 (to Israel) Dan Shapiro sees when he looks in the mirror." Yitz wrote to Glick (who is not related to the family), saying "I just wanted to tell you that our family is shocked that we haven't heard a single word from the US State Dept., the US Ambassador or any representative of the US government regarding the shooting of our brother a US citizen Yehuda Glick." "My father Prof. Shimon Glick served as a captain in the US Army. He was a federal employee both in the NIH (National Institutes of Health - ed.) and the VA (US Department of Veterans Affairs - ed.) taking part in a leading hormone research projects. The chief investigator, Rose (Rosalyn) Yalow was awarded a Nobel prize," continued Glick. The brother of the shooting victim emphasized "my father is one of only 5 Americans residing in Israel to be appointed to the US National Academy of Science! No outrage, no wishes of speedy recovery not a single word from any US official." Noting on the hypocrisy of the silence, Yitz added "this is in total contrast to the (Arab - ed.) teenager that attacked police with a Molotov Cocktail and the State Dept demanded a transparent investigation and not to mention (Palestinian Authority Chairman Mahmoud) Abbas' letter of support to the terrorist shooter (of Glick - ed.)." Journalist Lahav Harkov of the Jerusalem Post shared Caroline Glick's posting of the message on her Twitter account later on Tuesday, where Ambassador Shapiro responded to the issue. "US Consulate General in Jerusalem made several attempts to contact Mr. Glick’s family and today were able to make contact," wrote Shapiro on Tuesday, nearly a full week after the shooting in Jerusalem. The ambassador then tried to stave off discussion on the issue by saying "The Privacy Act prevents us from discussing details regarding American citizens without their express permission." "Ready to provide consular assistance to Mr. Glick or his family...Also worth noting (US) Secretary (of State John) Kerry & the State Dept. spokeswoman condemned the attack last week," concluded Shapiro. Many Twitter users commenting on the thread were unsatisfied with the excuse that the US Embassy was "unable" to make contact, and with the late response a week after the attack. They also commented that the US has yet to condemn the letter of support Abbas sent to the family of the Arab terrorist who shot Glick, and who later was killed in a gun battle with police. "We received with anger the announcement about the despicable crime perpetrated by the gangs of killing and terror in the Israeli occupation army, against the son, Muataz Ibrahim Hijazi, who rose to the heavens as a martyr for the defense of the rights of the Palestinian nation and the holy places,” Abbas wrote in the letter.